The new SAQA.com home page displays art from current shows. Studio Art Quilt Associates, Inc., (SAQA) the non-profit organization that promotes the art quilt world-wide has given a fresh face to its website. 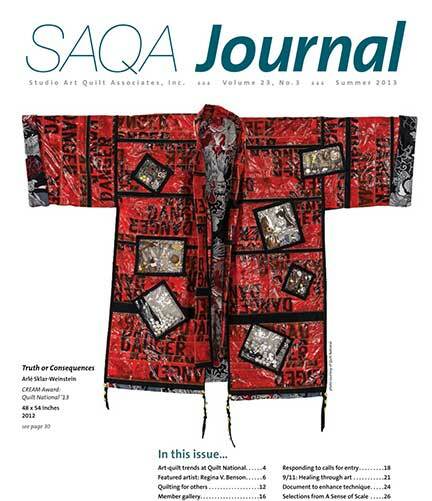 SAQA.com features upgraded navigation, a new blog focusing on information of interest to collectors, expanded artist member profiles and of course – more images of art quilts. The SAQA website re-design has been a recent priority for the organization, as the membership has grown to 31 countries. Websites like saqa.com and quiltnationalartists.com provide a bigger voice to artists engaged in the field of contemporary art quilts. According to SAQA Executive Director, Martha Sielman, 81% of Quilt National 2013 exhibitors are SAQA members. In her article “Art Quilt Trends at Quilt National ’13”, published in the Summer 2013 issue of the SAQA Journal, Ms. Sielman provides her observations of trends she observed in the Quilt National ’13 exhibit at the Dairy Barn, including the use of neutral palettes, dense stitching, and the use of recycled materials. Her discussion of the techniques and materials used by Quilt National artists suggests that the artwork in the show both reflects and shapes trends of which SAQA’s 3,000 members should be aware. With an improved navigation scheme, it is straightforward to locate information about the SAQA organization, view quilts by member artists, and even shop for art and art materials. 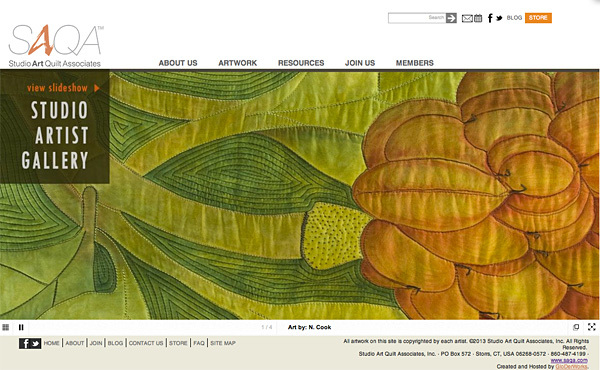 SAQA is a world-wide resource for information on the art quilt and the artists who create them. In addition to mounting museum-quality exhibitions that travel the world, SAQA documents the art quilt movement through exhibition catalogs and the continuing series of Portfolios, the art quilt sourcebook. The group creates professional development opportunities for the membership that continue to address the ever-changing needs of the artist. From basic studio management to mastering current technology for both business and artistic purposes, members have access to a treasure trove of support for taking their artwork and career to the next level. Over the past 25 years, SAQA has evolved into an active and dynamic organization that offers many services to its members as well as to the community at large. The website provides visibility to the accomplishments of the artist members and gives members immediate access to information about exhibition opportunities, announcements of upcoming events and conferences, and other resources.